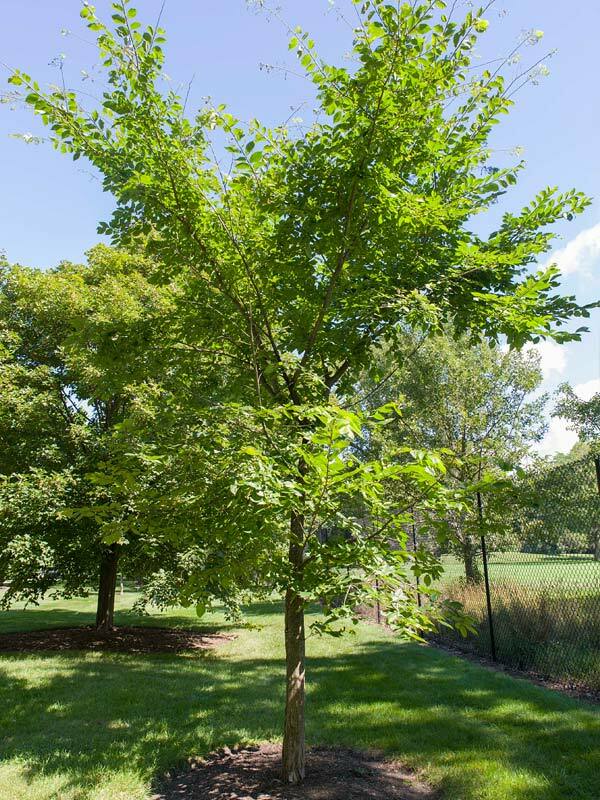 Valley Forge American elm is a large-maturing shade tree with a dense canopy of dark green leaves and the graceful arching habit and adaptability that formerly made this species among the most popular and beloved street trees. This deciduous tree typically grows to 60–80 feet tall with a broad-rounded crown. It is native to eastern and central North America. Non-showy, small green flowers appear in spring before the foliage emerges. Flowers give way to single-seeded, wafer-like samaras. Seeds mature in April-May as the leaves reach full size. Rough-textured, ovate-elliptic, dark green leaves (to 6 inches long) have toothed margins and asymetrical bases. Leaves typically turn yellow in fall. 'Valley Forge' has excellent resistance to Dutch elm disease.